Mindmatrix Inc., the Pittsburgh-based, leading channel and sales enablement software provider announced the release of its leaderboard feature today. As a company offering end-to-end channel and sales enablement platform and services, we know extremely well that a channel or sales enablement software is just one part of channel/sales enablement efforts. 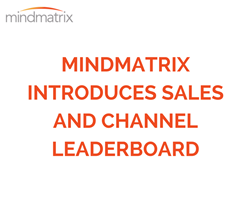 Mindmatrix Inc., the Pittsburgh-based, leading Channel and sales enablement software provider announced the release of its leaderboard feature today. The sales and channel leaderboards list top performing users and organizations (channel partners) based on various parameters. The parameters include user score and activities performed by the user within the channel-sales enablement platform such as emails sent, assets accessed and used, login count, etc,. Lead and sales related parameters such as lead count, closure ratio and number of leads closed are also monitored and taken into account when determining the top performing users and organizations. Harbinder Khera, CEO, Mindmatrix says, "As a company offering end-to-end channel and sales enablement platform and services, we know extremely well that a channel or sales enablement software is just one part of channel/sales enablement efforts. Getting your salespeople and channel partners to use them is another challenging, yet critical part of your enablement project. Our leaderboard enhancement helps in this regard by providing sales and channel managers a quick overview of their top performing salespeople and channel partner organizations in terms of engagement levels. They can, of course, get more detailed reports for the entire set of channel partner organizations and salespeople from the reporting section."